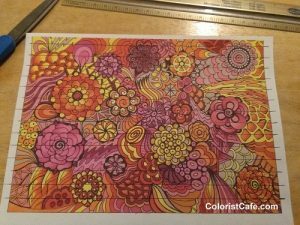 I’ve been working on a few projects with my finished coloring pages and wanted to share another one with you today. 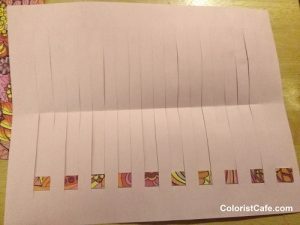 This project is like my other post where I cut a colored page into strips and glued them in an artistic design in a scrapbook. I’ll be using strips again in this project, but in this case, I’ll be weaving them. 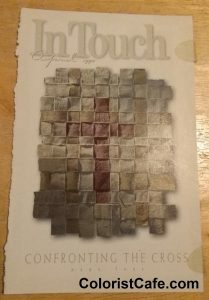 I’ve seen this idea before in school projects and was reminded of it by this magazine cover I got years ago and had collected in a pile of ideas I wanted to try. The one we’re working on today won’t look like the one on the cover because I’ve modified it. But feel free to get creative! 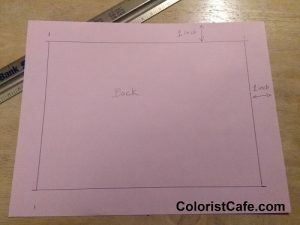 Get your blank piece of paper and measure and trace a border around the edge of the sheet. My border was 1” all the way around, but you can make yours the size you like and that looks good with your page. Take care in this next part! 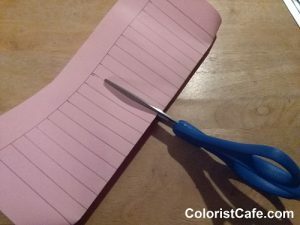 I’m showing you the quickest way to make slits in the page without cutting the page apart. As you can see in the picture, I’ve partially folded the paper in half the long way without creasing it hard. I also tried not to crease the border. 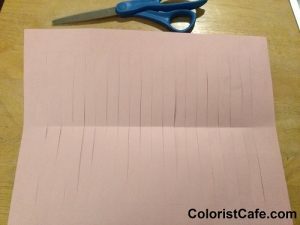 While holding the paper in half, cut along the lines so that it looks like a bunch of fringes when you’re done cutting. Open the paper and turn it over so you can’t see the marks, but you can see the slits like shown in the picture. First look at your page and decide if there is a direction in which it should be seen or the direction you will want to view it when it’s completed. 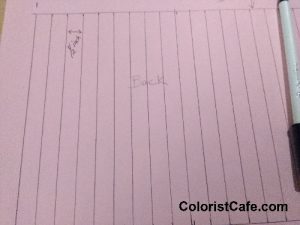 Cut the paper into strips along the lines you traced with the ruler. 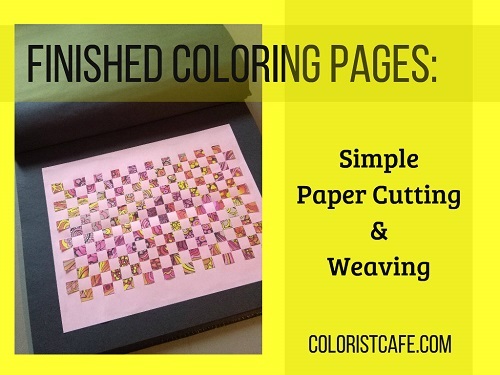 NOTE: If you want to view the page as it was before cutting, keep the strips in order as you cut them, or only cut one or two strips at a time. Take one of your strips and weave it over and under the slits. After weaving it in, you’ll have to slide the strip carefully all the way to the bottom of the slits to align it. Take another strip and weave it under and over, the opposite way as you just did it. Slide that strip down carefully also. The last couple strips are the hardest to weave in so be careful as you’re going. If something rips, don’t worry because it can probably be glued back together. Let it dry and either glue it into a scrapbook page, like I did (pictured at top of post), or put it in a sheet protector for protection. There really is no wrong way to do this! Be creative! 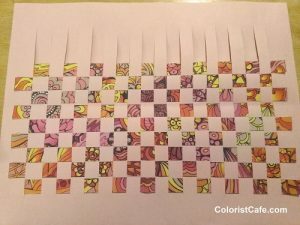 Change the weaving pattern, mix-n-match coloring pages, add other materials such as ribbons, rick rack or anything else you can think of! 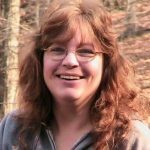 If you need a resource for the nifty Elmer’s Glue Pens I used, you can find them here at Amazon. 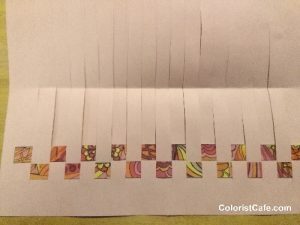 As I was finishing this post, I ran into a cool site where the artist uses her watercolor pages to create a ‘free-form’ style of weaving. She’s torn her strips before weaving, which is an awesome effect! As I said, get creative! Here’s to more creating with your finished coloring pages! P. S. Join my email list here to get notifications about posts like this!